So you run a youth club and you are organizing a special talent night. The first step is to get the right audio visual technology. You have many options open to you but a simple set up of PA system, stage and microphones should serve you well on the night. Young people have a need to assert their difference from the previous generation. They have a need to set themselves apart and express their own originality and identity. A talent show is an opportunity for them to do this. With the right audio visual equipment young people can express their power. They can entertain, impress and even scare their parents a little, which is how it should be. The show might include a young stand-up comedian, a piece of drama written and performed by members of the club, a singer/song writer with acoustic guitar and a rapper amongst other things. All these acts need are a few microphones and a PA system. However, if you really want to put on a show, hire a flat screen or projector to display images and film. These visuals will provide a background to the talent or they might be part of the programme itself. A film made by members of the club could open the show. It could make a dramatic statement that will set the tone for the evening’s performances. Another occasion for young people to shine is the school band competition. As far as audio visual technology goes this kind of event requires more than the youth club gig. The PA system needs to be more powerful and the stage needs to be larger. Lighting is also an option: LED uplighters will give the event the look and feel of a genuine concert. Sound Engineers For The Egos! This kind of event would also require a sound engineer: someone who can look after the technology as well as deal with the egos of young musicians. In fact, hiring a sound engineer is probably the most important thing to do for this kind of event. For many of the bands this will be their first performance so it is important that everything goes smoothly. The ability to deal with so many different styles of bands from pop to death metal and so many sensitive young egos is part of what makes a good sound engineer. He/she has many other skills. In fact, they are so skilled that they will look after pretty much everything on the night except to introduce the bands. It’s important for young people to express themselves artistically and to have an audience to perform to. It’s equally important for the parents of young people to admire and take pride in the next generation. As long as this tradition lasts and takes the shape of a talent show, it will be served by audio visual technology. 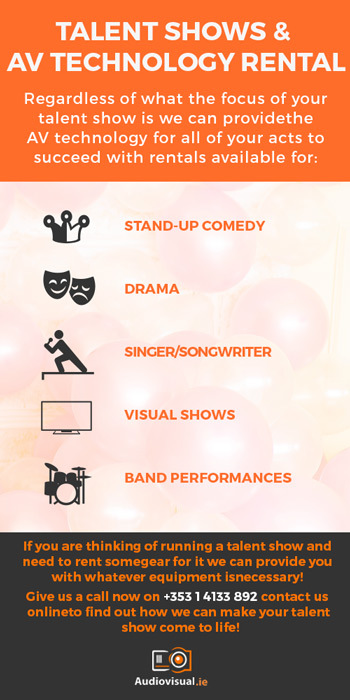 If you are thinking of running a talent show and need to rent some gear for it we can provide you with whatever equipment is necessary. Give us a call now on +353 1 4133 892, e-mail me directly at info@audiovisual.ie or contact us online to find out how we can make your talent show come to life!